This, above all else: beware the boring future. There are plenty of lessons to be learned from reading Extreme Metaphors: Interviews With J.G. Ballard 1967-2008, but this is the big one, something at which observers of technology and readers of science fiction will shudder with recognition. As befits a writer whose work began in the realm of the science fictional and gradually expanded in range and influence, the interviews here come from a vast range of media outlets. 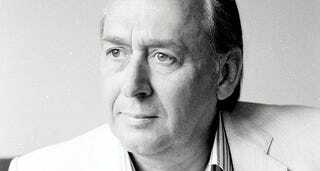 Ballard's interlocutors range from editors and journalists who interviewed him throughout his life (including Lynn Barber) to representatives of subsequent generations of British fiction (Hari Kunzru, Will Self). In a 1994 interview with Lukas Barr, Ballard bluntly states, "The future is going to be boring. The suburbanization of the planet will continue, and the suburbanization of the soul will follow soon after." In his introduction to the book, co-editor Simon Sellars (Dan O'Hara handled the afterword) observes the prescience of many of Ballard's predictions for the coming decades. And though that's the thesis of said introduction, the extent to which Ballard's remarks from the late 1960s and 1970s anticipate the current situation can be dizzying. Ballard's predictions encompass everything from the surveillance state to the rise of YouTube as a medium of expression. In 1974, Ballard spoke about a time when "at almost any given time all the information that will exist about ourselves will be on file somewhere." Five years later, he predicted that a typical individual would soon "have all the resources of a modern TV studio at his fingertips." Edward Snowden might well have emerged from a Ballard story; so, too, might the viral video you shared on Facebook last week. In a tribute following Ballard's death in 2009, Martin Amis wrote that "Ballard was a great exponent of the Flaubertian line — that writers should be orderly and predictable in their lives, so that they can be savage and sinister in their work." Repeatedly, interviewers talking with Ballard express surprise at his relatively sedate lifestyle: that the writer who opened 1975's High-Rise with the novel's central character eating a dog was himself a father of three who lived in a suburb of London and enjoyed a late-day glass of Scotch. Though reading this book, one might find some traces of the everyday interwoven with the transgressive: the 1992 interview where Ballard notes that "my heroes have a bland version of self-immolation," for one. Looking at the range of these interviews, it's also interesting to view them in light of literary history. Ballard's autobiographical novel Empire of the Sun received abundant critical acclaim, and was made into a Stephen Spielberg-directed film a few years after its release. Empire of the Sun marked a shift for Ballard's novel-length fiction into more realistic territory; it's notable, however, that on a timeline of his career, this occurred close to the center of that career. (The novel was released in 1984, the film in 1987.) It can also be interesting to see him interacting with culture: he speaks admiringly of the works of Kathy Acker, and refers to Damien Hirst, in a 1995 interview, as "a great novelist." Readers looking for fuel for debates over the nature of genre and the importance of science fiction will find plenty to quote here; several of the debates that Ballard had with interviewers are still being carried out on social media every day. Throughout his life, Ballard remained immeasurably difficult to quantify, in literature and in life. The later interviews of Extreme Metaphors tend to encompass the bulk of Ballard's life; O'Hara notes in a preface to a 2008 interview with James Naughtie that the conversation "has the tone of an elegy." That the later interviews concern Ballard's own memoir, 2008's Miracles of Life, compound this sense. In another late-period interview, Ballard observes, "I think the future died in 1945 with the atomic bombs at Hiroshima and Nagasaki." It's a haunting observation, one of many from an author whose work proved eerily prescient. This article originally appeared on Biographile. Tobias Carroll lives and writes in Brooklyn, New York, where he is the managing editor of Vol.1 Brooklyn. His fiction and nonfiction have been published by Tin House, The Collagist, Necessary Fiction, Bookforum, and Joyland. He can be found on Twitter at @TobiasCarroll, and online at www.thescowl.org.